A female veteran's journey of determination and recovery, thanks to you. Sometimes life has a way of coming around full circle. That is the case for Christine. Raised in the North College Hill, a suburb of Cincinnati, 52 years later she finds herself back home in the same community she grew up in getting ready to start the next chapter of her life. A chapter she is eager to begin. She went through boot camp in Orlando, Florida then electrician school in Grand Rapids, Michigan and eventually was stationed in San Francisco where she worked as an electrician repairing the Navy’s combat vessels. It was two months after being stationed at her base that she was called to serve in Desert Storm. She was stationed in Saudi Arabia where she continued her work as a naval electrician over the next 9 months. When the war ended she returned to her base in San Francisco and that is where she met her first husband. After her discharge they moved together to Illinois. While there Christine earned two bachelor’s degrees in Art History and Art Education with the goal of becoming an art teacher. After four years of marriage, it ended in a difficult divorce. It was at the time that Christine reconnected with her childhood sweetheart, Mike, and she made the decision to move back to Cincinnati. She was with Mike for nearly 20 years. They were happy and settled. Her world would change in 2014 when Mike had a sudden stroke and passed away. Christine was heart broken. The memories of the man she considered her husband were too much for her. She made the decision to leave the home they shared. Unable to find affordable housing on her own she moved in with her father. Though it was not an ideal situation she had a place to live and a support system. When she moved in she knew there was an issue with mold but it got increasingly worse while she was there. Christine became very sick and had to be hospitalized. Once she recovered she knew her father’s trailer was no longer an option. She began living between her brother and sister’s homes knowing that neither place was a permanent solution. It was at the time that she began reaching out to her resources and was connected with Volunteers of America Greater transitional housing facility, the Veteran Resource Center (VRC), in Mt. Healthy, Ohio. She entered the VRC on March 27, 2017. “It was great. 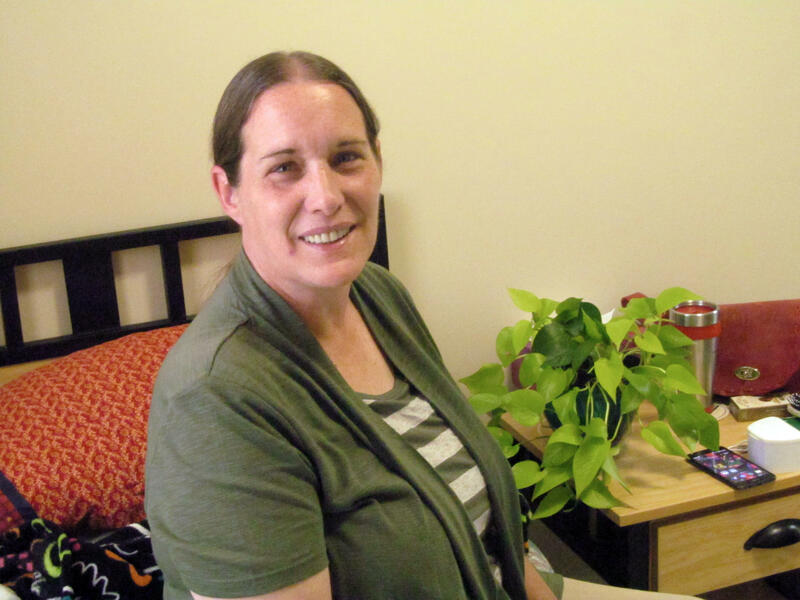 I had a bed that was mine and a meal every day.” While at the Veterans Resource Center Christine was able to connect with services to help her get on her feet. One of those benefits was the Hud-Vash voucher, a veteran specific rental assistance program. This is where Christine’s next chapter begins. She is one of the first tenants to move into Volunteers of America of Greater Ohio’s new affordable veteran housing community, Annabelle’s Place, located in the same neighborhood she grew up in, North College Hill. For Christine this represents a new beginning and first milestone for her. Her apartment in Annabelle’s Place will be the first place that she can call her own. This new chapter will be the first time being completely independent. With your support, we can help homeless female veterans, like Christine, to help continue their journey towards restoration.